I’m sure that family is probably one of the most important things to you (as it is me) and what better way to show someone how much you love them than by sharing knowledge that could help them livea lot longer? 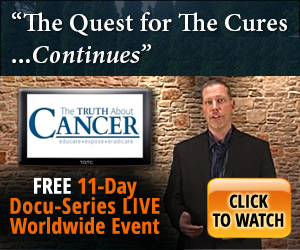 As I’m sure you’ve heard, my friends over at The Truth About Cancer, are airing an 11-day miniseries documentary called: “The Quest for The Cures…Continues”. You can watch absolutely for free (but only for this week). This dramatic docu-series follows one man’s “quest for the cures”, as he travels the country interviewing the topmost doctors and scientist and the patients they treat. If you’re ready to discover the truth and how you can not only prevent, but even treat and beat cancer, then you MUST SEE what some are calling ‘The Event of the Year’. The original quest for the cures was an internet sensation with over 1 million views and this new and improved series will simply blow you away with how much you’ll discover. This is one of the most powerful documentaries I’ve ever seen and I think you and your family will LOVE IT. Consider gathering the family together and spending some quality time watching this amazing docu-series. Jam-Packed full of real, usable content. I hope you enjoy this series with the ones you love as much as I did.